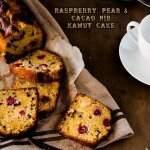 This Raspberry, Pear and Cacao Nib Kamut Cake recipe uses a mix of Kamut flour and almond meal, along with pear, raspberries and cacao nibs. Its a beautiful cake to serve with a cup of tea or coffee in the afternoon, and its also wonderful toasted slathered with butter. Place a rack in the lower third of the oven and preheat the oven to 180 celsius (350 fahrenheit). Line a 23cm (9 inch) by 9cm (3.5 inch) [amazon_link id="B001TO3CN8" target="_blank" ]loaf pan[/amazon_link] with parchment paper. Sift the flours, sugar, baking powder, and salt into the bowl of an electric mixer fitted with a paddle attachment. Place the eggs in a bowl and whisk to combine. Add the butter and eggs to the flour and mix on a medium speed until just combined. Add the cacao nibs and fold through with a rubber spatula. Place 1/3 of the mixture into the loaf pan and scatter with 1/3 of the pear and raspberries. Repeat with the remaining mixture. Make sure the raspberries and pears you have scattered on top are pushed into the mixture otherwise they will burn. Bake for 50 to 60 minutes or until a wooden skewer or toothpick inserted in the center of the cake comes out cleanly. If the cake is browning too quickly, cover with foil. Cool the cake in the pan on a rack for about 10 minutes, then remove loaf from the pan and cool completely on the rack. If you don't have Kamut flour you can use regular plain flour instead.